As a result, through this knowledge sharing in the new connected workplace, employees are learning very differently; they are learning continuously, autonomously and socially - as they carry out their daily work. In consequence, this now means that we need a new generation of "organised" learning practices - ones that are closer to the ways that people are now working and learning in their jobs. 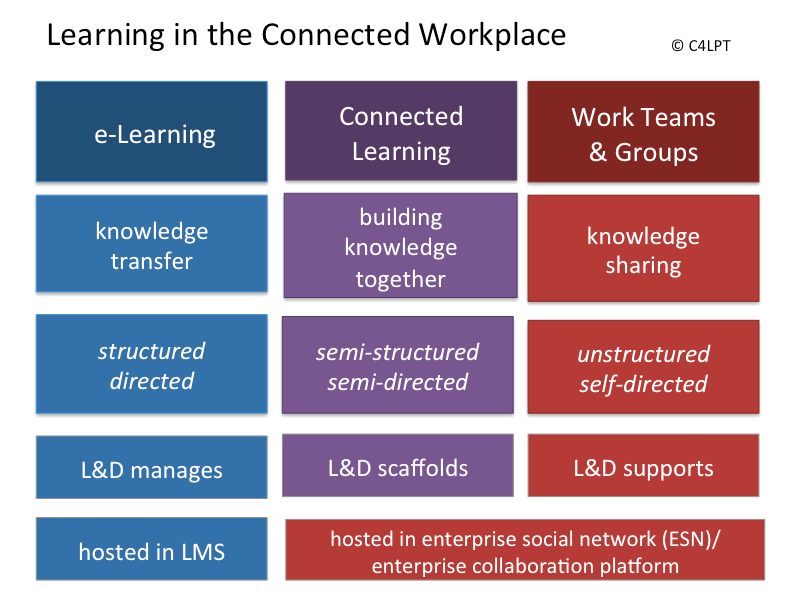 At the Connected Workplace Consultancy we have developed a new approach to designing (organised) learning that is more appropriate for today’s connected workforce, we call it Connected Learning for the Workplace. The following chart summarises some of the key elements in order to show how it fits in between current structured e-learning practices which focus on information transfer and the unstructured knowledge sharing that takes place in work teams and groups. The Connected Learning for the Workplace design approach embodies the following 5 principles - briefly explained below. scaffolding– rather than packaging up e-learning content, it involves building a framework for learning to take place. This framework provides just enough structure, without constraining personal and social learning. social first – social interaction lies at the heart of the learning experience - whether it be conversation, knowledge sharing, or collaboration in some other way so that participants can build their understanding together. In other words it is not just about tacking-on social interaction to content, and (en)forcing it. content second– key resources are provided to get participants thinking, conversing and. doing, but participants are also encouraged to contribute to the knowledge base of relevant resources. performance oriented – it is focused on what participants will be able to do as a result It does not track the (inter)activity to use this as a measure of success. After all activity doesn’t equal learning let alone performance. Performance might be assessed in a number of ways, through self-, peer- or even manager-evaluation, depending on the content and context. We have been using this design approach for a number of years now - not only for our own public online social workshops but also for those we run privately for other organisations. If you want to find out more about Connected Learning in the Workplace, then this will be the topic of my upcoming public online workshop running 11 November – 6 December 2013. By participating you will also experience connected learning as you find out more about it.Interested in signing up? You can do so HERE. Jane, I like your new principles for learning. I would just ask this question: where does the alignment to the business fit? I appreciate that it is outside each of the three groups so its exclusion is deliberate, but, do you think it changes as we move towards unstructured learning? They are ALL directly aligned to the business - but probably knowledge sharing in work teams as part of dally workflow is the closest in fact. Einstein on Knowledge Management For a great infographic on what Einstein thought about knowledge management take a look at my latest post on my Learning in the Social Workshop blog. My tweeted links from October 2013 These are the links to resources I tweeted in October 2013 – in reverse chronological order. If you haven’t got time to read them all, then take a look at the 12 I’ve highlighted.